"I think music actually, has been my true passion my whole life, and in the last fifteen years I’ve had a real opportunity to explore my passion." - James Dolan. With a sound steeped in bluegrass, blues and gospel, JD & The Straight Shot are taking their pure Americana sound to a new generation. 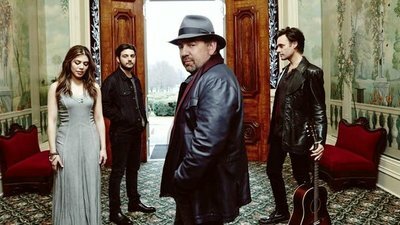 Led by the incomparable James Dolan, and featuring musicians that have worked with some of the most recognisable names in music, the sextet have just completed a short run of UK and Irish dates, in support of their just-released sixth album ‘Good Night And good Luck’. We caught up with Jim, along with guitarist Marc Copely and violinist Erin Slaver for a chat about the touring, recording and longevity. Nothing to hide; Eamon O’Neill. Hi all, how are you today? James Dolan: Yeah, we’re good, thank you! Welcome back to Europe; you’re fairly regular visitors to this part of the world, aren’t you? JD: We are. It is different here. You find the audiences here are a little more musically-savvy. They’re more attentive, and they’re more of a listening audience than a partying audience. They’re clearly there to enjoy the music. In the US, the audiences are also there to enjoy the music, but they’re also there to have a bit of a party and a good time. So we find that the audiences here are perfect for our music, because most of our music tells a story; each song tells a story, and you really have to pay attention in order to get the story. The last time you were in Europe you were opening for Don Henley; how did you enjoy that tour? JD: Obviously, it’s an honour and a privilege to open for Don. We’ve known him for quite some time. We did about fifty shows in the US a few years ago - mostly the US and Canada - opening for The Eagles, so we got to know Don pretty well, and that’s why I assume he invited us along on that tour. Don is a phenomenal talent, and we’re happy to hear that it looks like the Eagles are reforming, so I guess we’ll get to hear some more of that great music. We described your set on that tour as; “creating a laid back atmosphere that acted as the perfect appetiser”; would you say that’s an accurate description of your show? JD: I think that when you’re opening for a band like Henley’s band, or even for the Doobie Brothers, your job is to get everybody in the mood, so I think we structure our show that way, as the precursor to the band that they really came and paid to see. So, we take that role pretty seriously. Going back to what you said about each song telling a story; on stage, you go at great lengths to explain what each song is about. Is that an integral part of the act? JD: Well, I guess. As I said, almost every song we do has a story to it, and if you don’t know the story, and you’re just hearing the song for the first time, it’s a little hard to put context on it. So I try, as quickly as I can to tell a little bit about the story, so when people listen to the song, they hear the lyrics and understand what it is about and the meaning of it. You’ve just released your sixth album ‘Good Luck And Good Night’; how does it feel to be this far into your musical career? JD: Yeah, I sort of can’t believe we’ve done that many albums! We all love music in this band, we’re all avid musicians, and to be able to create music like we particularly created on this last record, we feel very proud of it, and we’re looking forward to doing more. How did working on this release compare to the previous albums? ES: I’ve only played on the past three albums, but working on this album was different because we had Marc Copely, our lead guitar player and musical director behind the board producing. So we really had a head who was in the music, and knew our ins and outs of everything. The other difference was, we had played almost all of these songs that we were recording live on several tours, and the music felt lived in. We knew what worked and what didn’t work, and we went in the studio with a totally different mind-set than in the past. It was cool to work on an album in that sense; already knowing what we wanted to accomplish, and just getting it. MC: Erin’s really summed it up; it was the easiest thing to produce. My whole philosophy going in is to make sure I don’t impart any sound into the band as a producer, because we already have a sound, and that’s just from the band playing all the time. So it’s really just about getting the best recording we can, and making it sound like us live. You’ve worked with B.B. King in the past Marc; who’s the harder taskmaster, B.B. or J.D.?! MC: When I played with B.B. King, that was back when I was 18 years old, so that’s a good many years ago! I was a little blues guitar player kid, and he was just super, super gracious. I learned a tonne, because you’re there with one of the masters, and hanging out with him, so it’s a whole other vibe. I can’t even remember half of the stuff from back then, but he really influenced me quickly. There are a lot of notable names connected to the musicians in the band; Sheryl Crow, Robert Plant and Rod Stewart to name a few; that’s quite a pedigree in one band. Going back to the album, and you pay a beautiful tribute to Glenn Frey with your version of The Eagles’ ‘It’s Your World Now’. JD: We knew Glen very well, and we miss him so very much. We did want to do something on the record that was a tribute to him, so we listened to a lot of his music and we picked this song. We actually went to his wife Sandy and asked her if it would be ok, and she said “yes”. She heard the track before we put it on the record, and she approved it. It’s an interesting track because Glen wrote it a long time ago, long before he was ever sick. It’s a song about saying goodbye, and about leaving. I think it’s got an eerie quality to it almost, in the fact that he had written this song and then left us the way he did. But it was a pleasure to play. 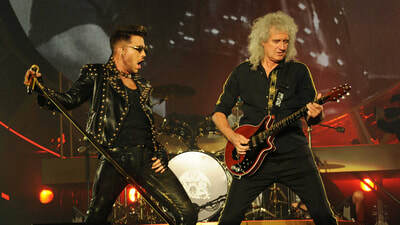 Will you be looking forward to performing it on your upcoming dates? JD: That’s a good question. I think we probably will perform it at The Cutting Room (venue in New York City). We’re going to have to try and do that; we’ll rehearse it! ​At this stage in your life, is music your true passion? JD: I think music actually, has been my true passion my whole life. At this point in my live, in the last fifteen years I’ve had a real opportunity to explore my passion, so I’m happy with that. Do you enjoy beingout on the road? JD: Yes. You know, what I’m really grateful about with the members of the band is we all get along very well. We do a lot of things together. We were all out last night together. We’ve been on the road with lots of bands, and some bands they play together but that’s all they do together, whereas this band we get together all the time, and we love seeing each other. What does the rest of the year hold for JD & The Straight Shot? JD: So, we’re finishing up here in Europe, and we do a show in New York, and then we crack on back and we’re waiting on our booker to tell us when, but I’m sure it’s going to be in the first quarter of next year. And then we are likely to go out and play some more with the Doobies; we’ve been playing with Chicago, and maybe one or two others. Finally, it’s difficult to read the album title ‘Good Luck And Good Night’ and not think that there’s a little bit of finality about it. JD: ‘Good Luck And Good Night’; it’s a play on words that has to do with an old journalist named Edward R. Murrow. He’s really considered to be the father of broadcast journalism, and he would end all of his news shows with; “Good night, and good luck”, so we flipped it around, because the song itself is a bit of a commentary on the degradation of journalism since the days of Mr. Edward R. Murrow. JD & The Straight Shot’s ‘Good Night And Good Luck’ is available now, via iTunes and Spotify. JD & The Straight Shot Rattle Ireland’s Rebel City. 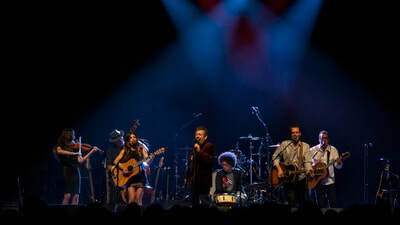 ​JD & The Straight Shot Announced As Special Guests For Don Henley Tour.